We make a thousand little decisions each day. Some of those decisions demand contemplation; others are made without any conscious reflection. We find ourselves brushing our teeth and pouring our morning coffee in reverie. Our morning routine seems void of decision-making until we start considering making that one phone call or writing that long overdue email. Then there are the kinds of decisions that escape these two categories. We make them instinctively. Some might call those decisions of the heart. Most remarks that stick with me are the ones I disagree with. It was no different in this case, but that was not the only reason I couldn't shake off the words of a fictional businessman with a lot of influence in Washington. They were memorable because they related so well to the art festival I recently attended. 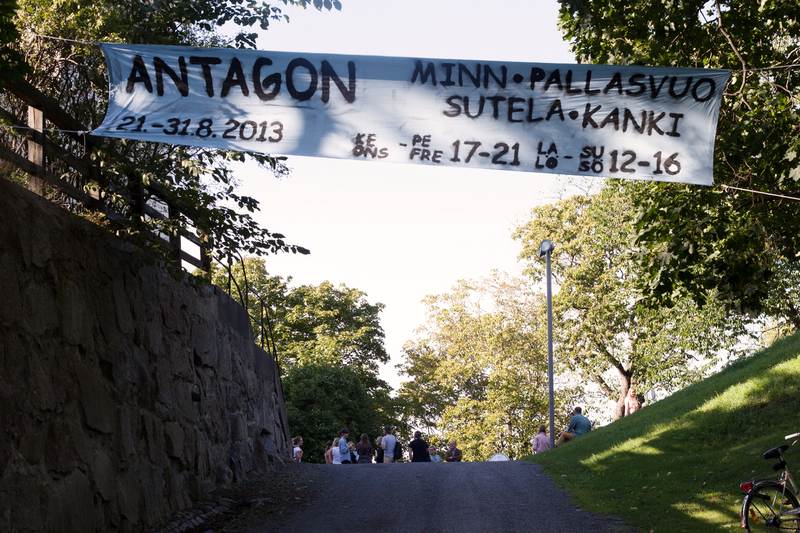 A festival in Turku, Finland, where instinct was celebrated and ratio was put to the side. Antagon opened with Jenna Sutela's latest instalment of her ongoing project New Degrees of Freedom. We were invited to the upper floor of Turku's observatory. It's many windows offered us a perfect panoramic view from the city's highest situated building. Each windowsill formed a niche, each slots gave space to one or two viewers. I stood in one niche, awaiting what was later going to feel like an introduction to the festival. Jenna's text, her presence, the similar-looking armour she made us wear, created a sense of unity. It decorated the room with a certain quiet, as if we could now leave behind all those distracting possibilities the internet provides us with, that constant pulling it seems to do so well. It startled me and it also made me much more aware of the all-encompassing view that enveloped us. The vast landscape and the endless identities we inhibit that don't require any physical space but find hiding in our computers, always lurking in the background. That ridiculously wide view that is somehow always accompanied by a voice whispering 'You can be whoever you want to be' in my ear became an essential part of Sutela' words. The relation between the landscape and the whisper might stem from the endless amount of movies we have watched, opening with a bird's-eye view of Manhattan, slowly zooming in the story's protagonist. Until that moment, until we find him or her, it can be whomever, we can be whomever. Those soft-spoken words that usually narrate the end of my airplane rides was now here with us, it had a body standing in the middle of the room..
Sutela installed one other work in the entrance of that same observatory. It's a video of Petra Schüttt, a Helsinki-based contortionist, crawling over a black and white checked floor wearing a fabric mimicking that same pattern. Petra found herself in a dance only she knew the choreography of and kept on replacing her body, creating an increasing sense of displacement. Or better said, a longing for displacement. That kind of longing is exactly what we hold high today: our ability to move and rearrange. We prove to be pretty capricious in our constant migrations and career moves, we doubt and reconsider every commitment, nothing is fixed or forever. That exhausting amount of possibilities and fleeting experience versus a distinct and in depth local experience turned out to be an opposition very much a part of Antagon. It was one of the antangonistic pairs I was about to encounter. 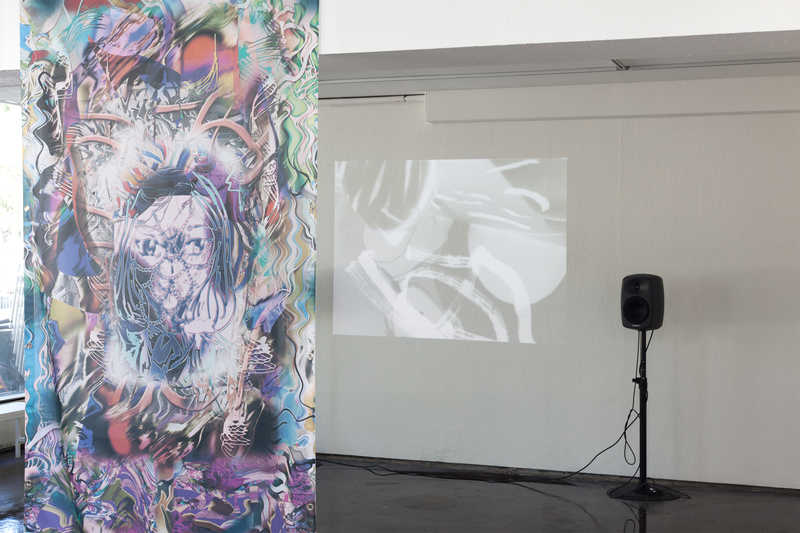 Antagon's focus on locality is further emphasized by producing and showing the Elina Minn's video work Maladetta Primavera. The movie follows a recently graduated art student in her pursuit of success, while trying to break free from the Turku art scene. We witness the competition between local artists all trying to find their place and the gossip that comes with it. Graduating from an art school is a sobering experience, excellently captured in this short film. Graduates are convinced of their uniqueness and the importance of their personal freedom, only to find themselves in rooms full of people doing and wanting the same. Even in her desire to break free from it all and move to Berlin the main character proves to be very much like everybody else. The movies speaks of endless possibilities proving to be illusionary, while keeping a fun and light-hearted tone. It's astonishing to see how little the fictional story differs from my experiences Amsterdam's art scene. By daring to paint a very specific picture, Maladetta Primavera manages to overcome it's locality. The video can serve as a mirror to others because it knows exactly what story it's telling. I could say the same about the festival as a whole. The locality of the festival's programming is one of its most extraordinary traits, a decision that feels much more deliberate in the era of mobility and communication, all of us owning those computers with far-reaching arms. There appears to be some kind of link between each of the participants of Antagon, some are long time friends, others studied at the same art school, some are former ghost of the internet now meeting in the flesh. Some of those people performed at a ball room belonging to the local fire fighter's station. I was surprised to find out the Turku fire fighters owned a ball room to begin with and even more surprised to find it as beautiful as it is. It would be best described as the place you wish your high school prom had taken place: a lot of fancy columns, a pompous balcony and a beautiful stage, complete with red, velvet curtains. The multi-coloured lighting and crazy amount of fire fighter portraits did the rest. Maanalainen seurakunta laulaa, which translates into something like 'The underground church singing', was the performance duo to open the evening's program. Their piece started with a large projection of the shiny faces of the two young men and a good amount of white smoke. A synchronized but not quite dance that was equal parts awkward and confident made up the second act of their performance. The third and most engaging part of their act involved a stuffed animal. A fluffy grey mouse laid there on the floor, inanimate as stuffed animals tend to be, until the duo intermittingly talked to it. They repeating the two contradicting lines 'wake up', 'don't wake up', interspersed with one of the two sipping on a tank of laughing gas hidden in a sleeping bag. The sleeping bag reinforced the boyish and innocent feel of their work, as if everything was the result of a camping trip where the two had been scheming tonight's performance. The mouse coming to life by being talked to served as a hilarious metaphor or reminder for what happens when we look at art. Because that is basically the audience's job: bring inanimate objects to life. 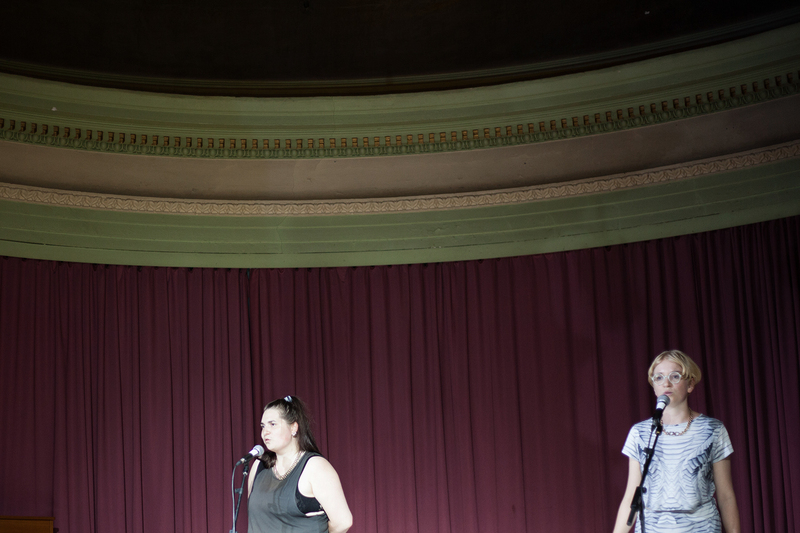 Next up were Echo + Seashell, a Dutch Finnish music duo, here to perform their new song 'Frutti di Mare.' The two flirt with pop music, the hidden desire of becoming a pop star is not so much a secret anymore as soon as they enter the stage. There lies the beauty of their performances, you get to see that longing, their not quite fulfilled desire of becoming a pop star and you get to enjoy the result how close they've actually become. Their songs echo the hit songs of Ace of Base and at the same time mimic a monologue of your best friend telling you what happened at the supermarket today. Here, I find the same adage 'You can be whoever you want to be' but it sounds completely different this time. Not in calculated words, mechanically spoken, but charmingly sung and hopeful words of an almost pop singer. 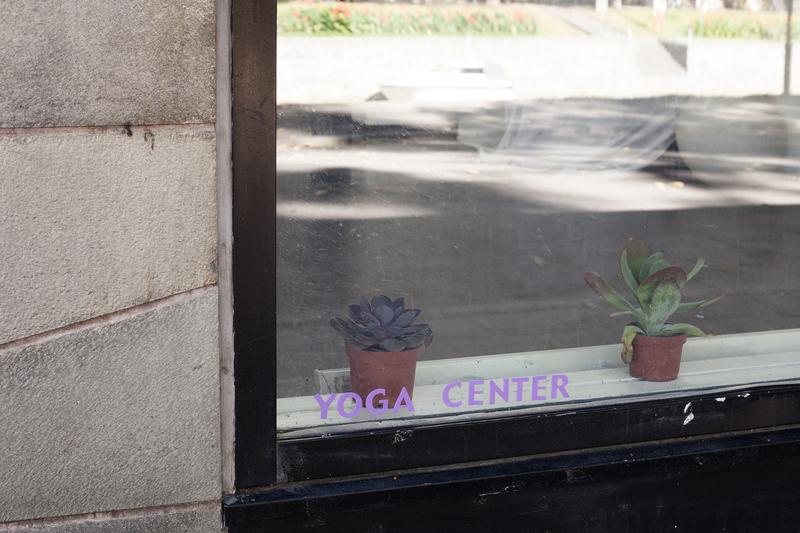 Kimmo Modig invited Swedish/Finnish collective, YOGA Center, to turn Titanik, a local gallery, into a yoga space and create a three-day exhibition including actual yoga classes. The collective originates in Gothenburg and consists out of Daniel Iinatti, Ida Lehtonen and Pontus Westerberg. Their shows or events have always implemented more universal, easy to access events that attracts a broader, more eclectic audience. Their Turku yoga classes functioned like an entrance to a space commonly known to be closed or high-brow. The events gave the gallery a great, new function and made it more accessible to visitors. Their show contained an installation by Carson Fisk Vittori; different vases combined with other found objects that were installed with specific directions from the artist and executed by the members of YOGA centre. They stood there, as both decorative and estranging elements. Among the other art works were an interactive and very trippy video game titled Nightscape Navigator by MSHR (an audiovisual project by Brenna Murphy and Birch Cooper originated in Portland). It was easy to get lost in the quirky, brightly coloured environment they created. Thomas Hämén scattered lenticular prints on the floor in a big circle, the images where simple gradients between orange and blue, depending on the position from which the work was viewed its colours changed. The viewer was in charge of reversing his sunset. A flag and painting by Jaakko Pallasvuo were designed by the artist and printed on demand. Pallasvuo erased the one original file after the online order was completed ensuring the works are unique pieces. It confronts us with an intriguing contradiction, the opposition between a one-off art work and the impersonal, dry means of handling the material proposes questions on authorship and ego. In fact, most of the work in this show did. It was either about whoever was handling the mouse or whatever position the viewer took looking at the sunset, or the final stages of works handled by the online printer or the members of YOGA Center executing Carson Fisk Vittori's directions. These are, by definition, collaborative works. Collaborations between the audience and the work, the artist and the online printer, or the curator and the artist. Kimmo Modig is that collaborative kind of curator, an insider who is one with the artists. He listens in during the process, trying to find out what a particular piece of art might need, resulting in a collaborative relationship. Befitting that attitude, he is part of the festival on his own account and doesn't hide behind an institution. Neither did he hide behind a curatorial statement or conceptual mission. It seems a very romantic point of view in glorying the importance of a 'free artistic and curatorial practice' but at the same time it's a down to earth perspective. It's saying, as an artist you don't depend on anyone but yourself if you choose to not depend on anything besides yourself. We create from a deeply personal place. From a point of view that is not easily grasped. Not easily put into words. Modig's reluctance to make sense out of anything the constructed, put together, or assembled, is refreshing. Just as he expects his artists not to hide behind any constructed truths, neither is he tempted to defend his curatorial practice by implementing a quote from Baudelaire or a reference to Heidegger. It's a valid question today's artists should be asking yourself. Because in the mist of the pressure scholarships, art institutions and the approval of an audience, the artist is supposed to keep his head cool and do what he loves. That is the only possible validation for one's work that is acceptable to Kimmo, it's in the end the only kind of practice an artist can defend. Later on, I returned to the sensation of togetherness that surrounded Turku during Antagon. During my absence, Titanik gallery had reached another set up installed by Megan Snowe and Reija Matilda Meriläinen. Their collaborative project revolves around social behaviour called 30 days of pick up art, a challenge taken from Neil Strauss' book on men who have mastered the art of seduction: Rules of the Game that will help the couple to become better social artists. 1. Pretend you're about the leave, but take no more than one step away. 2. Look back at the group and ask, out of curiosity, "Hey, how do you guys all know each other?" 3. Be ready to respond with a question or comment. 4. You may now leave with you all-purpose closer "Nice meeting you." or continue talking to the group if the conversation is going well. If anyone asks what you do, answer with the identity statement you created today. Here too, the questions revolving the artist and his audience are posed. What does it mean to be an artist today? Do we have to be social? In a time when introversion is underestimated and schools aim to turn every student into perfect social butterflies, how social does an artist have to be? What does today's intricate social landscape demand from artists? And if we're not interested in the scientification or theorization of the art practise, where are we taking it? It makes sense to lead the way into the direction of a more socially engaging artist, an element also reflected in the previous interpretation of the space by YOGA Centre, by opening up the usage of the gallery. And that's how it just be: art as a vital part of everyday life, at least as important as your weekly yoga class. Art doesn't speak to me in rational ways. My appreciation for an artwork depends on a thousand little decisions, some conscious, some unconscious, all of them are decisions of the heart. It's not how big, how much, which theory, which -ism, what year, what nationality. The great thing about encountering art is that we can let go of all of those parameters. My inclination towards certain artwork is connected the same kind of coincidences, passions, messiness, that is connected to how I've picked my lovers or friends. I meet, love and collect them without knowing exactly why. And finally, they, the accumulation of people surrounding me on a day-to-day basis as well as the art works and artist that I hold close to my heart, say more about me than I would be able to say about me. Some of those reasons become clear over time, sometimes they remain hidden. In that same way, Antagon's curatorial program is Kimmo Modig's self portrait. It says more about him than he could tell you. 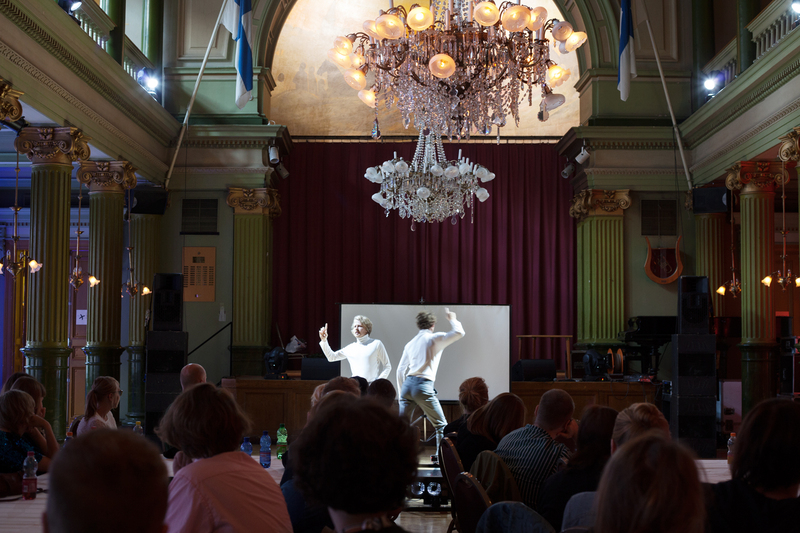 And if Antagon's program says something about him directly, it indirectly says something about Turku, Finland, the state of the local art scene and the kind of artists Finland's institutions bring forth. After a day in a museum I trust whatever sticks without reading every single credit next to the paintings or over analyzing my motives. When I enter a museum I want to be amazed, confused, touched. I don't want art to simplify the world around me, I want it to confront me with some of life's complexity. I'm not sure of the reason Kimmo introduced the programmed artists as mountains in the festival's trailer, but I could think of one. Proposing the performers and visual artists as part of nature shows how evident their existence is. To Kimmo, and therefore to us. He presents them and says: Look, they have always been here. Let's zoom in, let's give them the attention they deserve. While he curated, he was unveiling a landscape of relations, passions and affinities. The kinship between the festival's participants was palpable. Their artistic kinship was there for the viewer to unravel. The assembled artist could easily be seen as a bunch of islands that happen to exist in the same archipelago, a group of mountains someone started to call a mountain range. A constellation of stars that only become coherent if you wish. Modig wants to show, not tell. The viewers, make the stories in the end, connect the dots and try make sense out of what they see. What sets Antagon apart from the rest is that Kimmo Moddig wanted to introduce the kind of art he found worthwhile to a wider audience without having to validate his choices. He avoided a single position that attempts to rationalize his choices or any pursuit for reaching a conclusion. The coherence in his assemblage was not lost but very clear. It was him, the conceptual backbone was his backbone. And we were witnesses of his mind map. What Kimmo did, is partly about those numerous tiny decisions we make in our heads. Choices that are so natural to us, we become unaware of making them. We all have our preferences, we are all shaped by the people we have met and the stories we have heard. There's no point in trying to be unravel those influences, they are what make us extraordinary. Of course we will nor stop seeing art shows curated according to a theme or curatorial concept as a backbone. This kind of shows seem to have have found their antagonists. And every superhero needs a nemesis, someone to opposes and contends against, a muscle that counteracts the action of another muscle. In my opinion, Antagon succeeded in offering that kind of opposition. Modig's curatorial view is a slight utopian one, and by being that it can serve as a great proposition, as a way to start the discussion as an example of a new kind of curating that is more intriguing, honest and personal. Artist turned curators is not a new phenonemon, but it was great to see what it could do in Turku. Especially during a time when the academization of the curatorial practise is a concern to many, it's appealing to see a different approach. An approach that proves the importance of trusting your artistic and your everyday instincts.